Applied Biochemist 392550A Navigate A Selective Herbicide | Fountain City Art Ctr. 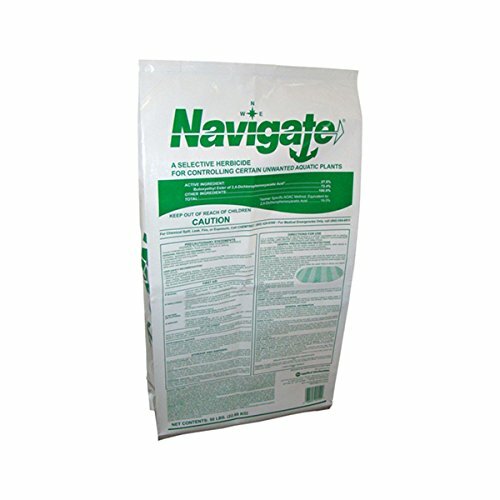 This product selectively targets certain nuisance aquatic plants, allowing desirable, native aquatic species to remain for fish habitat, bottom cover and oxygen production. This systemic herbicide provides optimum control of target plants when used at first signs of growth, before plants reach the surface. What is a Herbicides: Aquatic plants are unique in that plant species respond differently to different formulations. Our team is committed to discovering innovative solutions including: patented new chemistries, combination treatments, application technologies and technical resources on the subject of plant management. Lonza Water Treatment offers a variety of Applied Biochemists herbicides which vary in plant controlled, active ingredient, use sites, formulation, application rate, water use restrictions, dilution requirements, permit requirements and product registration/availability. About the Brand: Applied Biochemists was developed with the service professional in mind. Our water care products are both economical and powerful enough for the toughest jobs. Within Applied Biochemist's wide selection of products we offer everything from algae and deposit control formulas to non-chlorine shock treatments, powerful surface cleaners, clarifiers, enzyme-based cleaners and more. If you have any questions about this product by Applied Biochemist, contact us by completing and submitting the form below. If you are looking for a specif part number, please include it with your message.